Banner – University Medical Center Tucson will welcome its first patients to its new, nine-story patient tower beginning Monday, April 22. “Banner – University Medicine is proud to present this 21st century academic medical center to Southern Arizona and to our partners at the University of Arizona,” said Chad Whelan, MD, CEO of Banner – University Medicine in Tucson. “It’s a once-in-a-lifetime opportunity to move into a new building like this,” he said. “It gives us the opportunity to transform the patient-care model to deliver a truly collaborative, team-based approach to care,” he said. With this 670,000-square-foot tower expansion, Banner – UMC Tucson’s capacity will increase from 479 to 649 licensed beds. Adult ICU beds, always in high demand at Banner – UMC, will increase by 96 new beds. The new tower, which includes $50 million in new patient-care equipment and computer technology, replaces older sections of the original hospital building, which opened in 1971 as University Hospital. Then, as now, the hospital serves as the primary teaching hospital of the University of Arizona College of Medicine – Tucson. It has been recognized as a U.S. News and World Report “Best Hospital” every year for more than two decades. The hospital’s main lobby and entrance will shift to the new tower, which is surrounded by ample surface parking and nearby covered parking. Valet service will be available at this new entrance. The main thoroughfare onto the hospital campus is now at Campbell Avenue and East Elm Street. 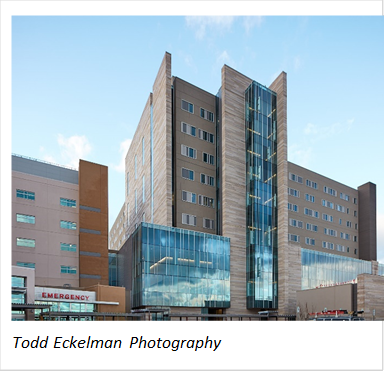 Frost thanked the hospital’s staff, its neighbors, EMS workers and the community for their patience during nearly four years of construction on the busy Banner – UMC campus, which also is home to Diamond Children’s Medical Center and Southern Arizona’s only Level I trauma center. The tower was designed by architects Shepley Bulfinch, engineers AEI and GLHN Architects & Engineers (Tucson). The lead contractor was Sundt I DPR. The hospital’s renovation is so massive, it will have a new address as of April 22: Banner – UMC Tucson 1625 N. Campbell Ave. Tucson AZ 85719. Banner – University Medicine cordially invites the Tucson community to preview the tower’s first two floors from 9 a.m.-3 p.m. on Sunday, April 7, when the tower will serve as the starting point for Cyclovia Tucson’s spring route for cyclists and walkers. In addition to guided tours, there will be live music, food trucks, a rock climbing wall, a zip line, giveaways and family-friendly activities just outside the tower. Cyclovia Tucson’s three-mile, car-free route will run from the tower to the Warehouse Arts District. Banner – University Medicine is the title sponsor for this popular, free community event.